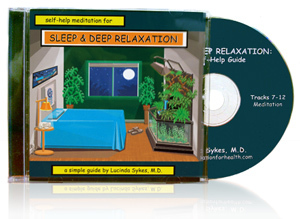 We developed this CD for our clinic patients coping with sleeplessness & stress. It’s proved useful for temporary sleeplessness, as well as for chronic insomnia & sleep deprivation. The CD does not tell listeners to relax or to sleep. Instead, the spoken guide brings attention to basic feelings of breathing & being physically present. This type of attention helps the mind to settle naturally. As one of our patients noted, “I fall asleep without even trying”. This CD can be used to “take a break” during the day. By listening to the guided meditation, people direct their attention away from worries and distressing thoughts. They find stress relief without forcing it. A spoken introduction explains how to practice & answers common questions. Simple directions focus attention to your feeling of breathing & being physically present. Step by step, you move awareness through your body while you listen to the guide. You’re not expected to get rid of thoughts or to change your feelings. Instead, you just pay attention to your breath & other sensations, directed by the guide. Requires no particular skill or previous meditation experience. Purchase of the CD also gives you “Better Sleep Tips”, our clinic’s workbook of self-help insomnia tips. Read Chapters 1-7 of “Better Sleep Tips” at this site, free of charge. Pay with Visa, Mastercard, American Express, PayPal or money order. If you have a psychiatric or medical illness, discuss use of this CD with your doctor. In particular, this CD may not be appropriate for people who have some types of mental illness (such as schizophrenia, bipolar illness, PTSD or panic disorder). Ask your doctor or psychiatrist for guidance.